The Master Lock Company values continuous improvement and regularly assesses our business to identify opportunities for operational efficiencies. Due to a high degree of similarity between the Master Lock 6835/S6835 Powder Coated Aluminum Safety Padlocks and the American Lock A1100/S1100 Anodized Aluminum Safety Padlocks, we have the chance to simplify the product line while continuing to maximize user application coverage. 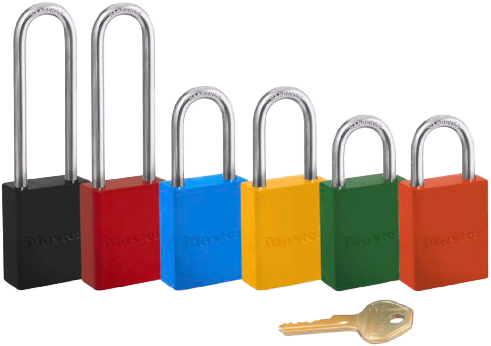 As a result, we will be discontinuing the Master Lock 6835/S6835 Powder Coated Aluminum Safety Padlocks, effective July 1, 2019. Beyond that date, the American Lock A1100/S1100 Series will be the sole aluminum safety padlocks offered by The Master Lock Company. Our sales teams are fully prepared to assist facilities in the process of adopting the new replacement padlocks, and customer support teams are ready to answer questions to ensure a smooth ordering process. There are also resources available for download below to get started. Announcement Letter Read the official retirement announcement. 6835/S6835 Retirement FAQ Find answers to some of the most commonly asked questions. 6835/S6835 Retirement Quick Reference Guide Find the suggested replacement for your current padlock model. Please contact your distributor or Master Lock Customer Support to determine your exact model number for future ordering. 6835/S6835 Laser Engraving Reference Guide Learn how to replicate or extend existing laser engraving from your current padlock model to the replacement models. For more information, please contact us at 1-800-308-9244 or click here.